SharePoint Wiki vs OneNote to get the job done? Quick or “Wiki” in Hawaiian has become a popular term and many even forget where it comes from. The purpose is to quickly author content and link to other content as well. The SharePoint Wiki has become the default type of pages when creating “Collaboration Sites” or “Team Sites” with the purpose of quickly creating, editing and deleting content if needs be. But as things change in the collaboration space of Microsoft within SharePoint and the new things coming, I started to wonder if I was using the right tool. I am not sure I would go as far as comparing one with the other, but OneNote offers that “quick” the Wiki promises, very differently. If you’re not familiar with OneNote, I recommend you start checking it out as it becomes a part of your regular Office Suite. Alright, it’s already part of the Office Suite, but I am talking part of your routine like Word and Excel. 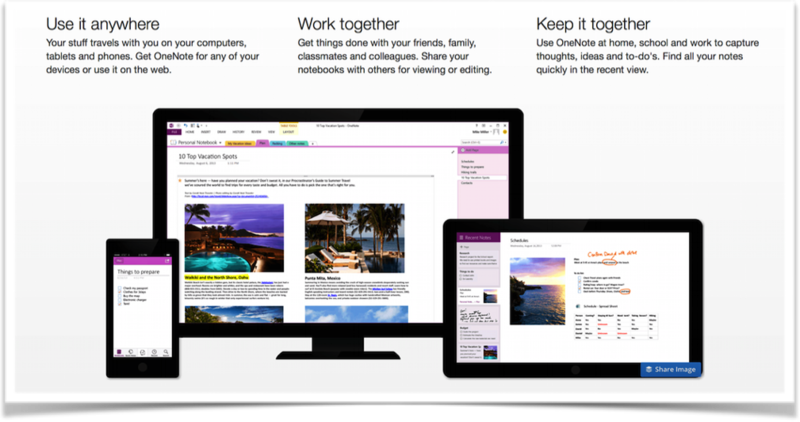 In short, OneNote is a note taking app as the name suggests and is quite successful at it. Files created are Notebooks and have different pages and tabs within it. It natively comes with co-authoring support so every can work on it at the same time and allows you to clip content from the web and add it in easily. I have to say I am quite pleased with it and it’s not just because it’s available on the Mac as well. My favorite exemple of it being used was by the Australian and New Zealand Share The Point conferences. Making it available on all devices including the web, so I always had my agenda and the conference information with me. Best part, if they had to make changes or announcements it would instantly be updated on my read only version of the notebook…brilliant. Not only is it easy to create content in it and find it, but it works with SharePoint as a regular document with all the features a library has to offer and works on any device while providing some serious co-authoring capabilities. It’s no secret that things are changing, SharePoint is a vast platform that has always allowed us to do almost anything we want with it. Recently, I started to Re-Think Collaboration with SharePoint and Office 365 and talked about it in a previous blog. And that started a lot of thinking on my part, I realized I was doing the same thing to attack problems customers were having. The SharePoint Wiki has been a favorite of mine for a while, but like Excel it feels I am using it for any problem I am trying to solve related to quick content creating, editing and linking. There used to be different forms of Wikis in SharePoint, Enterprise Wiki with and Wiki Pages Library. Today, only the Wiki Pages Library is really left on recent versions of SharePoint and Office 365. In fact, every time you create a SharePoint Team Site, you are already using a Wiki, it’s become standard on collaboration sites within the platform. The advantages are somewhat obvious, unlike the Web Part Page you don’t need the Content Editor to write content and don’t need to find a Summary Links Web Part to add a list of Links on the page. The Wiki Page in SharePoint provides the flexibility of writing content using different layouts, but also add Apps and Web Parts on it. Since a Page is nothing but a document in a Document Library, it also comes with versioning, content approval and anything else you might need that comes with content management. To create and link new pages or content from an existing Wiki Page, you can type [[ and you will see a menu drop down allowing you to navigate the existing site to link something or create a page that does not yet exist. The down side is that it does not support co-authoring nor does it work out of the box with different devices. You’ll argue that it’s a web page and thus it definitely works on all devices and you’re right. The issue is that it is not formatted for it and creating content can be very difficult as even images need to be uploaded first. My experience is that though Wiki means quick, the content creation and editing isn’t always quick and easy for every scenario. I am not trying to say one is better than the other, but it’s important to consider that there are different tools for what you are trying to solve in your organization. If you’re about to migrate to a new version of SharePoint or moving to Office 365, you might want to think about whether or not that Wiki makes sense as a Wiki. Migration is the idea time to re-think some of the things we have put in place within SharePoint and as things change, so do the tools that can help us. What I am saying is, make sure you look at OneNote for it’s NoteBook capabilities as it applies to many existing Wiki scenarios. In the past, I’d often create my Governance Plan as a Wiki for example. And I am not even sure OneNote will be a good replacement for it as with the Wiki I benefit from URLs I can easily add anywhere in my SharePoint. However, it’s important to ask ourselves the question and make sure we have the best solution for our problems. I see OneNote joining my suite of solutions when I need Co-Authoring of content that needs to be well organized and presented on multiple device, but that is also easy and quick to create or consume.